One of the resources that First Western Federal Savings Bank is proud to offer comes in the form of CRP Payments. This is a resource available to many people across the country who work in one of the toughest industries, but these payments are relatively unknown to the vast majority of the country. In today’s blog, First Western Federal Savings Bank will dive into some frequently asked questions regarding all things CRP-related. Knowing the details of CRP payments is an amazing way to acquire additional income in the agricultural industry. Read on to find out more about CRP Payments, and work with First Western to get the financial help you need. Offering IRA non-recourse loans and more, contact us today to align your fiscal path to the right destination. What does “CRP” stand for? As the IRS states, “CRP” is the acronym for the Conservation Reserve Program. It is a land conservation program that is facilitated by the Farm Service Agency (FSA). In essence, taxpayers enroll in a land contract, somewhere between 10-15 years in length. During this time, they voluntarily agree to implement a conservation plan on land that had been previously used for farming or ranching. Land that has been used for agricultural purposes is worn down and disrupted over time, and often does not utilize or encourage the growth of native species. This is problematic in the long run, because eventually the land will become unusable, unless proper methods for conservation and restoration are taken into effect. When did CRP come to be? In 1985, former president Ronald Reagan signed CRP into law as an effort to conserve the environment and facilitate eco-friendly practices. In the time since then, the water quality in areas where CRP has taken place has shown improvement, as well as a reduced amount of soil erosion. What does CRP look like in practice? There have been multiple initiatives throughout the years since CRP was signed into law, all of which are designated to a certain species. One recent CRP initiative was with the Honey Bee Habitat. In recent years, honey bees have become an endangered species, which spells out certain catastrophe if their decline continues apace. As pollinators, honey bees are crucial to the growth of our food sources—truly everything we eat relies on plants to some extent or another, and therefore by association, honey bees as well. Through CRP, farmers and landowners are provided the financial means to work on healthy restoration of habitats for honey bees. It was specifically available in Michigan, Minnesota, North Dakota, South Dakota and Wisconsin. Other CRP initiatives have included or involved duck habitats, longleaf pines, wetlands, highly erodible land, and more. How have farmers and other participants felt about CRP? As an article in Ag Daily reported in 2016 (over 20 years after the inception of the program), “Hundreds of thousands of farmers value FSA’s Conservation Reserve Program.” Being a farmer is one of the toughest and most important jobs in our society, and is also one of the most overlooked and underappreciated. It is incredibly challenging to make a living as a farmer, especially considering it’s a job with virtually zero vacations or days off. This is a program that offers both financial incentive to farmers while also incentivizing eco-friendly practices. 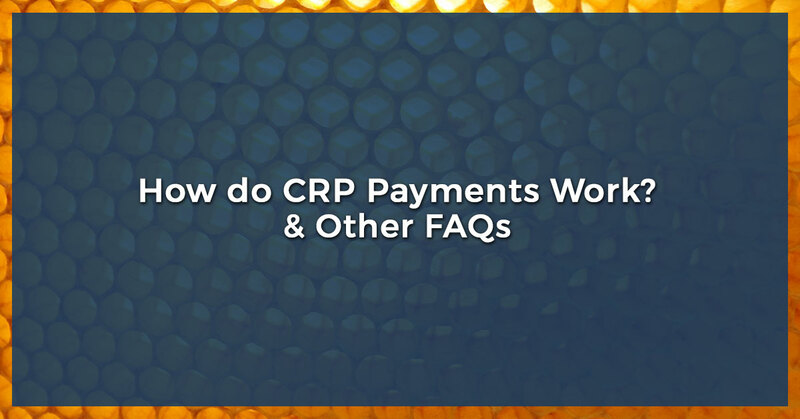 What is a CRP payment? In exchange for not using the land for agriculture or other more destructive, non-native measures, taxpayers receive a payment for each year of their contract, as well as cost-sharing payments for the coinciding costs of carrying out the conservation plan. According to the IRS, “Unless the taxpayer is receiving Social Security, retirement or disability benefits, CRP ‘annual rental payments’ are includible in net income from self-employment subject to self-employment tax.” Essentially, this means a CRP payment can, in some circumstances, serve as an additional form of income. That being said, it is a taxable form of income and must be reported on all federal tax returns. Where does First Western Federal Savings Bank come in? When you receive a CRP payment, First Western can cash out your payment for present value, in just a few days. This is a service that is not available at every bank, and in fact, this is one of the valuable resources that First Western is known for. Whether you are a rancher, a farmer, or simply a landowner, you have the potential to qualify for CRP and its subsequent payments. This is an incredible opportunity to not only increase your income, but to also contribute to the environment as a whole. Cashing out your CRP payments with First Western is one of the most positive ways you can not only impact your community or your wallet, but also the earth itself. Contact First Western today!